According to Gartner, only 1 in 25 CIOs deployed AI in 2018, yet 11 in 25 СIOs are planning to do it in 2019. AI is a pure hype in the world of technologies. Yet, this enormous popularity is justified: AI provides opportunities not only to individuals but also to business, society, and government. Evolving at a rapid pace, it revolutionizes every corner of every industry. The majority of business executives cannot afford to neglect AI and simply have to implement it if they want to be competitive over time. 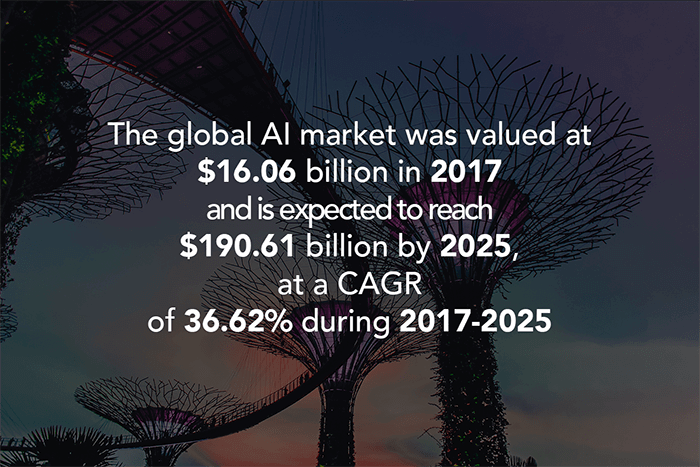 According to MarketsandMarkets, the global AI market was valued at $16.06 billion in 2017 and is expected to reach $190.61 billion by 2025, at a CAGR of 36.62% during 2017-2025. Artificial intelligence is an extremely wide area of computer science that first emerged in the 1950s and by the 2000s had already found its use in such tech giants as Google, Apple, and Amazon. Essentially, AI refers to the ability of a machine or computer to perform tasks that require human intelligence, like decision-making, machine learning, natural language processing, and visual perception. This technology has a sheer scope of applications and can be used to perform complex work or accomplish specific business tasks depending on the requirements of the company. Environment, Health and Safety (EHS) is a set of processes, rules, standards, and regulations aimed at the protection of the environment, company employees and society from any damage. Today organizations and governments pay close attention to EHS issues, putting a lot of efforts into the improvement of the sustainability of health and safety performances in the workplace. According to MarketsandMarkets, the global EHS market size is expected to grow from $4.36 billion in 2017 to $7.38 billion by 2022, at a CAGR of 11.1% during 2017-2022. AI has already entered the EHS industry, providing a significant number of benefits and improvements. First of all, this technology can offer intelligent databases with a built-in AI. That means that an AI system will monitor and analyze sustainability data and then compare them to prescribed parameters in order to detect errors or areas that are to be considered. Such systems are also able to alert if thresholds are exceeded or some anomaly is detected. This allows engineers, compliance managers or chemists to focus on problems rather than waste time on checking the areas which the AI-system indicates as non-problematic. Another sector where AI proves its efficiency is predictive maintenance: based on the data it generates, AI systems can provide recommendations and forecast any failures or accidents. It’s impossible to overestimate this opportunity in a risky environment. AI-based technology can improve emissions monitoring, water quality management, waste management, and incident management, enhancing efficiency, reducing costs and managing time and resources more effectively. While AI-driven technology is quite firmly established in such industries as agriculture, sales, and marketing, healthcare, manufacturing, logistics, automotive etc., the EHS segment is only on the way to its implementation. Companies slowly but steadily adapt their safety programs to keep pace with evolving technological advances. Leading EHS software providers have already implemented various AI tools, such as data mining and machine learning, to improve a company’s key figures. Using data mining tools and techniques across key markets helps to identify trends and make predictions. With the help of data mining tools, EHS software developers solve the problem of the inefficient use of the emission credits that routinely results in halting the production. AI technologies allow to track operational processes and monitor emissions in order to detect problematic areas and anomalies in real time. On the basis of the input data, an AI-based predictable operational model can estimate emissions, identify warning signs of potential problems and preemptively resolve them before they occur, minimizing human intervention. Cisco is one of the brightest cases of AI utilization in the EHS sector. The company realized that it must find some effective solution of the safety problem of the employees to reduce the risk for human life and health. 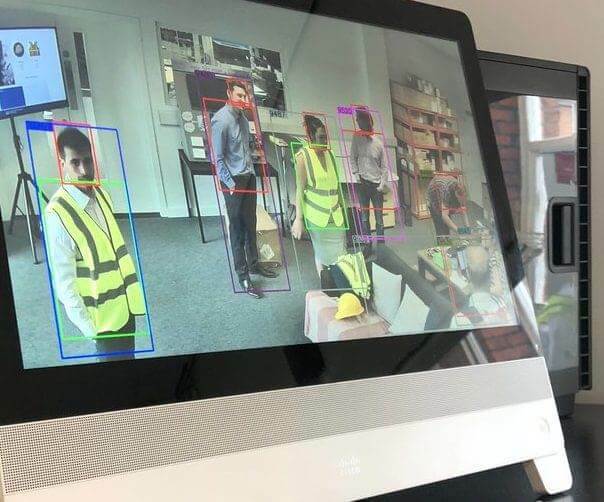 Recently Cisco, which is besides a multinational technology conglomerate that manufactures telecommunications equipment, launched a project to develop an Automated Intelligent System for Assuring Safe Working Environments, known as AI-SAFE. The project was initiated by the UK’s innovation agency and aims at automating safety checks in the workplace. By using real-time video analysis and machine learning, AI-SAFE provides monitoring of employee safety gear. By tracking entry and exit to the working environment, the system is able to assess the suitability of workers’ personal protective equipment (PPE). If an employee doesn’t comply with the requirements (forgets to put on headwear, glassware, and footwear), the system will signal and the access to the workplace will be denied till the person is properly equipped. Such a system allows to avoid human errors and enhances higher employee safety in comparison with manual PPE checks. Machine Learning (ML) is a sub-field of AI that allows computers or devices to learn from the input data without human intervention. The machine learning algorithms are able to adjust to the new data and constantly improve themselves due to specially programmed algorithms. This technology can help the EHS industry to enhance the decision-making processes, reduce risks, help save the environment, human health, and even lives. For example, voice, image and text recognition that is based on ML algorithms, enables better compliance to EHS regulations, as it can analyze huge amounts of visual and verbal data, detect errors, as well as alert users to potential hazards. Deep Learning is a subsection of ML, which implies artificial neural networks and algorithms that are designed the way human’s nervous system is. The technology is able to learn from extremely large amounts of data. By analyzing and categorizing a company’s data, the system can handle waste management and risk assessment, improve occupational safety and health and enhance operational efficiency. application for the EHS industry are evident: it can control emissions, mitigate risks, identify trends and perform preventative measures. In other words, AI takes human error out of workplace incidents. 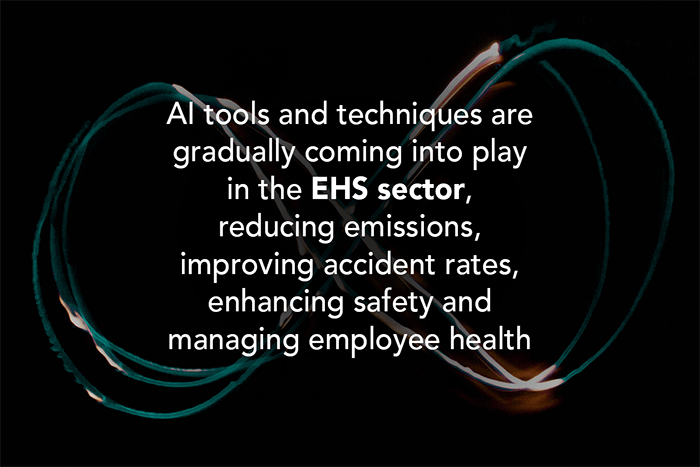 As AI is edging its way into our lives, AI tools and techniques are gradually coming into play in the EHS sector, reducing emissions, improving accident rates, enhancing safety and managing employee health. By applying AI-driven technologies, enterprises can enjoy significant financial and environmental benefits, greater reputation and long-term business growth based on sustainable and environmentally sound operations.